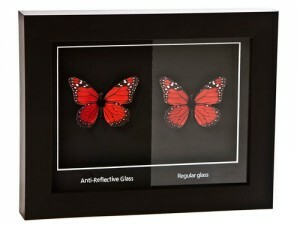 Artglass sets a new industry standard in framing glass. State-of-the-art technology allows Artglass to have the lowest visible light reflection, precisely tuned for unparalleled clarity and color correctness. Artglass is ideal for framing graphics, watercolors, and photographs; as well as ultra-transparent displays for three-dimensional works of art, archival documents, collectibles and other valuables. Artglass is available in sheets or cut to size from stock.